Sometimes my life is just one endless debate over hybridity/fusion. Last night was the latest chapter, with Kiran Ahluwalia's CD release performance at Joe's Pub in New York. Ahluwalia sings Ghazals and Punjabi folk songs, mainly in a traditional style. (According to her website, she studied the art of Ghazal for several years in Hyderabad with a teacher named Vithal Rao, "one of the last living court musicians of the Nizam (King) of Hyderabad.") She has a remarkable, strong, unique voice. For that alone, I strongly recommend her music. The difference -- and perhaps, the controversy -- is in her band, which includes western guitar and bass, and has a bit of a jazz sensibility. There is also just a hint of jazz in Ahluwalia's voice in some tracks. Nothing too obvious, but it's there in her live rendition of songs like "Rabh da Roop" (the CD version is a little different -- more "asli"). A traditional Punjabi version might really play up the melodrama of the song ("My friend, I have found my love/ but lost myself./ The intoxication of my passion/ overwhelmed me/ and I lost myself."). But in Ahluwalia's rendition it still comes across as just a little playful. Not everyone likes what Ahluwalia is doing. I ran into a couple of old friends at the show -- both ABCDs. They said they didn't especially like the fusion elements; somehow it made the music seem a little light. One quip that stuck in my mind was their sense that the fusion wasn't "necessary," and I can see what they mean. You could sing ghazals the way Jagjit & Chitra do it, or do Punjabi songs the way someone like Abida Parveen sings them (or indeed, the way Jagjit & Chitra did, on occasion). In traditional renditions, you hear strong emotion, and voices straining with longing at every note. But Ahluwalia never quite goes there. She sings her songs the way western folk singers might sing their songs -- with feeling, but with a certain restraint that comes, I suspect, from a commitment to technical precision: it's more important that I hit every note just right, than it is that you believe that I'm really feeling the emotion of this song right now. My friends might have a point about the "necessity" of fusion in the formal sense. But in a more practical sense, they're definitely wrong. Without the fusion element, there is no to arrange a CD debut performance at an elite venue like Joe's Pub. Without fusion, also, you don't get a major record contract with a prominent World Music label, and you don't get a room full of sophisticated New Yorkers (half of the audience was non-Indian) loving your music. 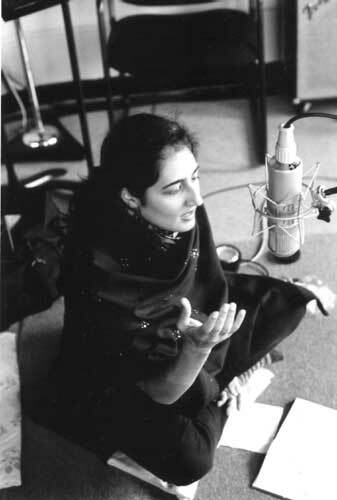 To put it quite directly, without fusion, there is no way Kiran Ahluwalia and her band could get paid like professional musicians at an early phase in their career. Amardeep, you're always a pleasure to read on music. I listened to the WNYC show you linked, and it's absolutely fascinating. Ahluwalia reminds me of Susheela Raman, another wonderful singer whose mixed-background (in her case Australia and, I think, Tamil Nadu) informs and enriches her music. Raman seems to me an even closer comparative to Ahluwalia, than someone like Rabbi Sher-gil. By the way, I've been loving Rabbi's album (I picked it up on a whim in Bombay last December), and his song "Tere Bin" has grown on me in a huge way. I even prefer it to his big hit "Bulla ki jana", a wonderful song that merits its fame. Let's go see something in the city together sometime. Maybe a Vijay Iyer show? Isn't Ghazal itself fusion music? At what point does any fusion become necessary? To whom? If there is an audience must there not be a necessity? Or maybe that was your point. Tell me honestly though, do you really believe all who appeared to enjoy the music that night really did? I remember going to a Joshua Redman show in Boston. You could say everyone enjoyed the show, but at some level it was clear (to Joshua Redman as well, who made it clear in some of his banter), that some were there so they could say they had been to the show. Otherwise they might have well have been in a bar with the music on the stereo system. Incidentally, these are beautiful pictures. I would be curious to hear about the occasion, maybe over coffee or something. About Ghazal itself being fusion music, yes. But the odd thing is that people now react to it as an established tradition with norms that are to be followed. And there is sometimes a bit of grumbling if a foreigner or ABCD doesn't quite do it the way one is accustomed to hearing it. And about the number of people who were just there to say they were there -- you've hit on the essential nature of bourgeois New York! Everyone brags about every little thing they see. Amardeep - didnt you just prove the critic's point that fusion IS a sellout? You sacrifice artistry for superficial elements to make a buck. Its a free world of course, but dont expect respect from traditionalists for selling out. And ghazals, classical Indian music etc. do NOT require wester audiences to survive - they remain quite vibrant in their own environment and the fusion artiste is NOT doing the form a favor. Ravi Shankar did NOT play fusion to achieve his considerable fame either (the "fusion" nature of his instrument comes from the fact that the sitar itself is adopted from Iran/Afghanistan, and both he and his guru absorbed a wide variety of musical influences. But he played "proper" classical music). True fusion is rare - compare Mandolin Srinivas playing fully traditional carnatic on the mandolin, and compare to sellout L Subramanian wasting his considerable talent showing off for westerners. Regarding Susheela Raman, having heard the originals of classical compositions that she sometimes sings - its hard for me to say anything positive about here. Perhaps if one has not heard classical music, those renditions may be palatable. I didn't say anything about whether Indian classical music needs western help in order to survive. I don't think Kiran Ahluwalia sacrifices any artistry in her music, and I don't think "sell-out" is fair at all. Have a listen and tell me what you think. One thing that definitely comes across on the CD and live is her discipline, control, and respect for the tradition. You might buy that argument, or not. One of the difficulties I have in arguing about fusion in music is that the arguments can be very subjective, and most are dispensable. In the end it probably doesn't matter what we say. What matters is whether the music works or not. My own verdict, in her case, would go something like this: it works, mostly. It's not transcendent, but it is very congenial. Would go well with white wine and tandoori fish at a dinner party. Everything now considered sacred was at one time fusion. Fusion drives cultural innovation-- cities like New York and Bombay are great fusion engines. Like AS says, the relevant argument is whether it works and possibly whether it's being mislabeled or passed off as classical. I attended her concert in Victoria recently.Kiran Ahluwalia deserves all the accolades she gets.She was accompanied with Rez Abbasi (Jazz guitarist). I'm listening to her CD at the moment (picked it out at random from the library). Her voice is absolutely breath-taking. I much prefer the slow ghazals to the up-tempo songs. And the fiddle (atleast I think that is the instrument that mirrors the vocals on tracks like Awara) played by Natalie MacMaster (never heard of her) totally works ! The only thing I dislike is the bollywoody arrangements to some of the up-tempo tracks. Otherwise, I love it. I think my favourite track is "Yaar" (with lyrics by Bahadur Shah Zafar --- the last mughal emporer ?, and music by her ghazal teacher Vithal Rao). Follow-up From Yesterday: Thoughts on India, Iraq, Globalization, and "Empire"